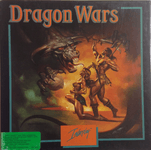 Dragon Wars is a fantasy role-playing video game developed by Interplay Entertainment in 1989, and distributed by Activision. During the initial design process for Bard's Tale III: Thief of Fate, one of the designers came up with a list of enhancements and improvements for the game. In essence, the game was a fusion of Bard's Tale and design philosophy pioneered in Wasteland. Until a month before release the game was developed as "Bard's Tale IV". The designers of the Bard's Tale series, Wasteland, and Battle Chess pooled their talents to create the ultimate role-playing fantasy. They knew it had to be a first-rate story with sophisticated graphics. The result was Dragon Wars. Sailing across uncharted seas, you and your party are in search of a legendary paradise called Dilmun — a place where the streets are paved with gold and no one wants for anything. However, King Drake of Phoebus has declared all magic illegal - magickers have been slain or fled into exile. In retaliation, enemy islands have threatened to unleash their guardian dragons, the most destructive force in the world. While docked at a harbor in Dilmun, you are arrested on suspicion of spellcasting. Imprisoned and stripped of everything but your wits, you are sentenced to life in a cesspool called Purgatory. Magic is your only salvation - a worldly possession in a world possessed. Source: Wikipedia, "Dragon Wars," available under the CC-BY-SA License. Bard's Tale IV: Original 'working title'. A month before release the name was changed because the rights to the title were still held by Electronic Arts. Dragon Wars: The official release name. Since to this point the game didn't feature any dragons, the new title meant that Heineman had to add one.